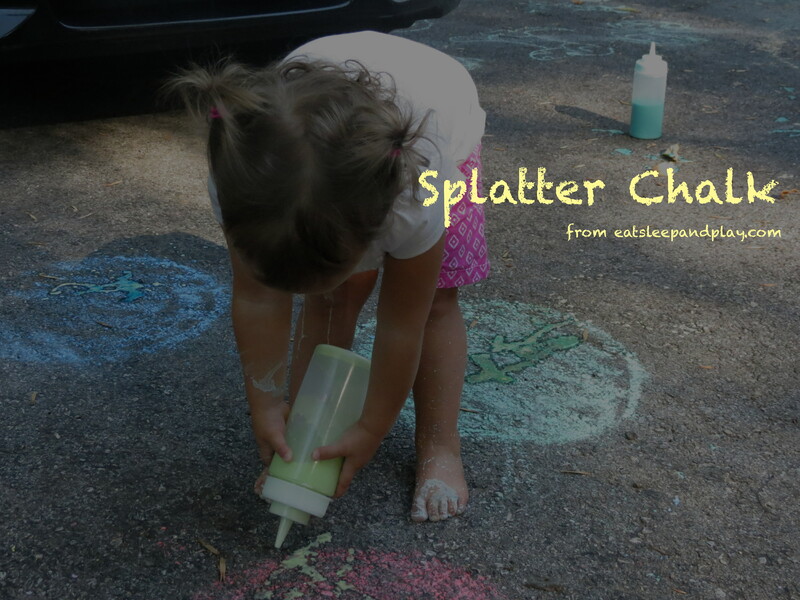 A few weeks ago I posted the directions for making chalk paint (you can find it here). 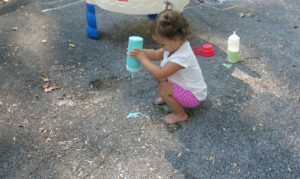 Layla loved it, so when I heard there was a way to make chalk paint that you can use in squirt bottles I jumped on it! I first tried using my very simple recipe of ground up chalk and water, and it didn’t quite work. This recipe was too watery, and no amount of stirring or shaking could get everything mixed up enough to the proper consistency. 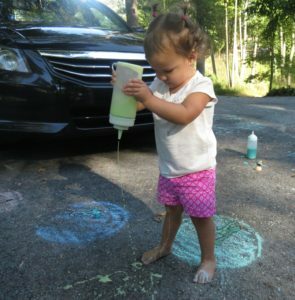 I was able to mix up some basic items that you likely have in your cabinet to create a chalk that can be used in any type of squirt bottle! If you are an extra brave parent, you could even put this mixture in a squirt gun! Have no fear- every drop of this chalk came out of Layla’s clothes in the wash. Since Layla is fairly young I knew I had to choose a squirt bottle that would not be too complicated for her to use. I opted for basic condiment containers like these , which worked great because even the slightest squeeze made the chalk squirt out. If you don’t feel like purchasing a container like this, you could try using an empty dish soap or shampoo bottle. If I had one complaint about this activity, it would be that when kids are using the chalk in this form it tends to be used up very quickly (and as you will see below- you need pretty large quantities of the materials to make it). If I had one piece of advice, it would be don’t let your kids do this right next to your husbands black car, because you might just turn around and find that they have decorated the side in purple chalk paint. Woops, but that is why I LOVE CHALK! A little squirt of the hose and all sins have been forgiven! Decide which colors you want to make/how many bottles you will need. 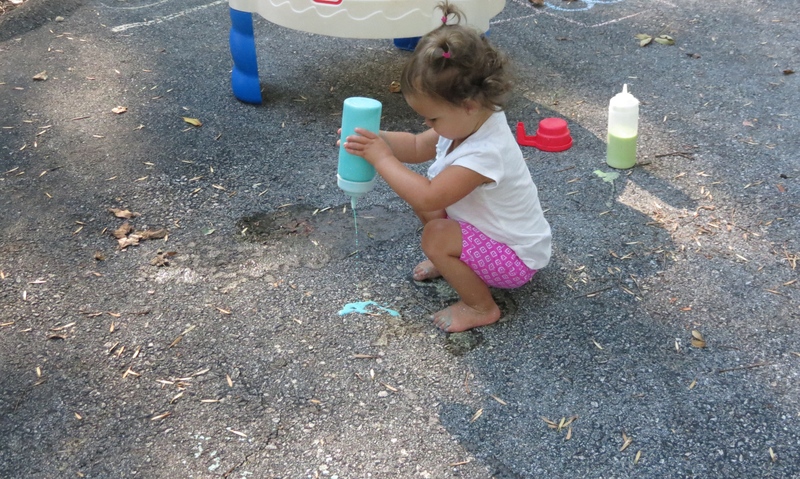 I used almost a full box of cornstarch and baking soda for three bottles of chalk, so be aware that you will need quite a bit! For each bottle add equal parts cornstarch and baking soda. (For my 16 oz squirt bottle I used 8 TBSP of each.) Drop your food coloring into the mixture and fill the rest of the bottle with very warm water. The color will begin to spread through the mixture, and cornstarch/baking soda combination at the bottom will become pretty hard. Use a spoon or butter knife, break up the powder and stir it through well. (Prior to use, give the chalk a good shake so that anything that has settled on the bottom gets incorporated back in.) This mixture will look very watery, and when you first squirt it on the ground it will just look wet. Have no fear, after drying for about 5 seconds it will change, creating a brightly colored chalk! We did not use all of our chalk on the first day and when we went back the following day the cornstarch had gotten hard again. Repeating the mixing process got everything back to normal, and it worked just as well. For bright colors, try some of the food coloring recipes below!